I've been pretty silent on this page, and it's because SURPRISE! I'm dealing with another huge life change. While I have struggled with various health problems, including the primary one I am dealing with now (progressive scoliosis), for my entire life- those issues have never prevented me from living a fairly normal life. Well, folks, that has changed. My condition and the complications and multiple aspects of my disability is one that I am going to post about soon, but today I am opting to share the five things I've learned about life with a disability. 1. HAVING a disability is VERY different from CARING for someone disabled. Those who have followed me for a while are aware that I was the very proud mama of children with varying disabilities. Fostering a total of about 50 kids in the four years I was a foster parent, I parented a number of children with varying disabilities from physical to emotional to psychological. 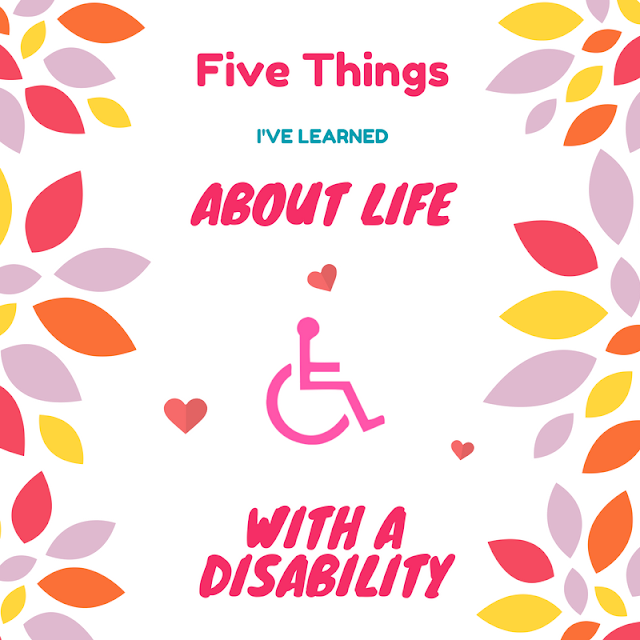 I thought that I was fully aware of life with a disability because I cared for and dealt with so many different types of doctors and specialists and situations in which gave me tools and snapshots into how much more challenging life is when you are differently abled. Well, that's just not the case. When YOU are typically abled, you are able to adapt things for the person you are caring about that they would be unable to do on their own. While this may give you a glimpse into that world, it is very different from BEING in that world. The internal emotional and psychological struggles with having a physical disability have been almost harder than the physical struggles I'm having. It is HORRIFYING to be taking a bath and have to call your boyfriend to come help you because you realize that you can't get up. The life changes of having to adapt your life to just flat out NOT being able to do the things that you have always been able to do are extremely hard and something that could take even the most positive person and bring them down. 2. The world is NOT made for differently-abled people. I have had to adapt everything in my life to just be able to get through a lot of days. Things like using the scooter at the grocery store, using a walker at my house, getting a special cushion for the car, getting a handicap pass for parking, and more. On not-great days, I do get out of the house, but always as a passenger in the car, and I have to take help with me to get out. It NEVER occurred to me how many stores don't have accessible options for someone who isn't able to walk well or walk for any period of time past a moment or two. Grocery stores are good about having scooters, but what about the dollar store, big lots, the pet store, a book store, etc? People don't realize how much something as simple as the option of a motorized scooter can actually determine whether or not you can even enter a store. Many stores and places do not have accessible aisles. Crowded buildings? I have to legitimately worry about someone accidentally bumping into me because the SLIGHTEST thing can put me down for as long as two weeks. Not having enough handicap parking spots? Means I usually have to skip the errand. Walking across a parking lot, even on a good day, can put me down. Steps, stairs, etc. are sometimes enough that I have to completely avoid places. The point is, while the world is certainly better than it used to be, the truth is- living independently with a physical disability shows you how challenging the world is when you can't physically do things that other people can do. Don't get me wrong, this doesn't apply to all people. There are plenty of amazing and wonderful people in the world, which is going to be the next point I talk about in this post. But no, this applies to the fact that I REALLY didn't understand how many RUDE people are out there when you suddenly can't do what everyone else can do. I have been stared at, laughed at, knocked down, bumped into, and more- just doing something as simple as going to the grocery store. Now, don't get me wrong, the laughs have been few, and a few times I'm pretty sure it's because they thought I was just being "funny" riding around on the motorized scooter. I've pulled into the handicap spot at the store, assuming it's a day where I'm able to drive, and been gawked at. Usually this is just until I get out of the car and I'm seen moving slower than an average person. Assuming it's a very good day, and I'm able to walk normally, then I've been very gawked at. Just two days ago I was at the gas station getting coffee. I was already in moderate pain (which is every day) but was determined to continue having a "good" day. So I'm standing there, and some guy bumps into me, his elbow going right into my side, which knocked me sideways into the counter, causing INSTANT shooting pain. Did he say sorry? No. He glanced in my direction then kept walking. People have cut me off at the grocery store when I'm heading to a checkout line. I made a vet appointment for Jaxson and had to call to cancel because I was having a bad pain day and the boyfriend was unable to get to my house soon enough to take him for me. The receptionist who took the call said "Well I have back problems too, but I don't let it get me down. I just take my meds and keep it moving." What I WANTED to say, but didn't, (because of this amazing thing called manners) was "Awesome. I'm happy you have the option of doing that, and believe me if I was able to just pop a pill and feel better- my doctor, my boyfriend, and myself would all be much happier than we currently are with my condition." Basically, I'm learning that the privilege that you have for having typical abilities is one that most people don't even recognize that they have. Sure, they may say or think "Thankfully I can walk" but they don't quite understand the depth of their privilege. I was in HARD denial in the beginning of this journey, but once I actually stopped isolating myself and began to express what was actually going on to my friends, I discovered very quickly how much those friends cared. People who had been friends, but not close friends, were suddenly stopping by with food and helping with my dog. One of my friends came over and cleaned my house when I wasn't able to even get up without help. Another got groceries for me. Another got the cushion that has helped me be able to drive on good days. It's extremely hard to admit out loud that things most people, including myself, took for granted, are suddenly challenging to impossible to do. Once you do that though, you realize how much love surrounds you that you maybe didn't even know was there. My friends, and absolutely my boyfriend, has shown me that I'm not alone- even when I think I am. This is definitely going to be a topic that I bring up more and more. 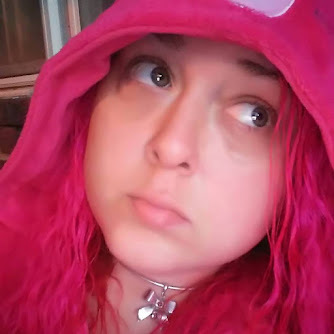 I actually hope to do some filming for my youtube channel to just show the many, many, many hoops required to jump through seeking basic help for someone in my situation, to just many times be rejected or told that there is no help for me. There have been days I have made over 50 phone calls to various offices, organizations, and facilities trying to get help with issues facing me with my disability. I have started a day with a phone number or referral that I thought was positive, to just get jerked around and transferred around and end up in tears on the phone with operator number 14 just asking for someone to talk to me about my situation. Now, I am young, and I am intellectually capable. For the elderly or the intellectually challenged, I have NO CLUE how they even BEGIN to navigate the services and system supposedly designed to help. Many days it feels completely impossible. I think most Americans who have the privilege of typical abilities have absolutely no clue how challenging it is to get help. There's this ridiculous rhetoric that there are all these "entitlements" to people who have disabilities. This isn't true. While help DOES exist (I hear), getting through the door to GET that help is almost impossible.